For the uninformed, Lance Wallnau is a false prophet extraordinaire. He is the huckster that prophesied that God was raising up Donald Trump to be a "wrecking ball" in America and claimed that God will use him as He used King Cyrus. But something happened on the way to the election. Something dark and evil that Strang and Wallnau did not foresee. Something named Donald Trump. They got in bed with the devil and now they are stuck. The national polls have Trump down by double digits and a potential electoral landslide is imminent. If this holds true, the good news is Lance Wallnau will be completely exposed by God as the false prophet that he is. This is what happens when you pretend to be Christian but you are only serving your own idolatry and carnality. Even according to the title of this article, the musings of Wallnau are called a prophecy. Well what does that mean biblically? It means Lance Wallnau is presuming to speak for God. It is not that Wallnau is saying he thinks Donald Trump is a wrecking ball and will be used as King Cyrus was. No beloved. Wallnau is claiming God is saying these things. So Mr. Strang, why are you so upset at the people you label as self-righteous and weak kneed Evangelicals? Why are you upset that people rightly expressed outrage at the lewd and lascivious comments from Trump in 2005? Can they sway enough people to not vote for Trump if God has decreed he will be this wrecking ball and King Cyrus? Why is it so dire that people listen to your podcast and repost your nonsense on social media? Is God still God? If He speaks is there anything that can stop what He has declared? In his fever to see the carnal man he wants elected, Strang exposes himself as a fraud. Prophecy is prophecy. When prophets in the Bible declared thus sayeth the Lord they did not have to rally support for it to come to pass. They did not have to write articles and do podcasts to ensure that it came to pass. Do you know why Steve? Because God said it! I wrote at the time of this false prophecy the absurd nature of it. The complete misusing of the story of King Cyrus. 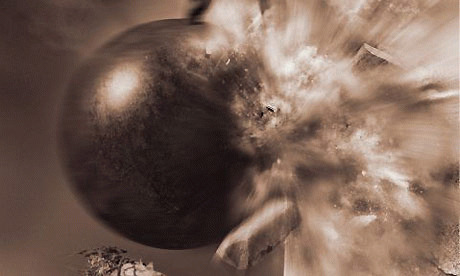 The silliness of the wrecking ball vision Wallnau claimed to have received from God. But this is the norm across the Charismaniacal landscape. False prophets emboldened to make ridiculous prophecies in the name of the Lord and when it doesn't pan out they will find a place to lay the blame elsewhere or talk about how a 65% accuracy rating is acceptable when the Bible says one wrong prophecy and you are forever a false prophet. Consider the key verses today from the days of Jeremiah, an actual prophet of the Lord. There is nothing new under the sun beloved. What is past is prologue. God did not send Lance Wallnau yet he chose to run with his carnal prophecies born out of his wicked idolatry of this country. God did not speak to Lance Wallnau. He gave him no vision of Trump being a wrecking ball. He gave him no insight into the story of King Cyrus. If Wallnau had truly stood in the council of the Lord then he would have proclaimed words to the people of God; not to the world. He would have proclaimed words to Christians about their evil deeds in these last days. He would have warned them to turn from their evil ways. Their evil ways of constantly looking to man to solve their problems through politics. Their evil ways of idolizing the Sodom that they live in. Their evil ways of following false prophets like Wallnau and idolatry pimps like Strang. That is the beauty of an article like this. It exposes not only the falseness of Lance Wallnau but the sheer wickedness of Steve Strang and his bully pulpit of Charisma News. Strang does not use Charisma to serve the Lord but rather to serve himself and his political operatives. The majority of the stories you see on Charisma these days are defending the most indefensible man to ever run for president or propping up the most absurd false teachers and prophets of our day like Jennifer Leclaire, Bill Johnson, and countless others. The Bible says that we are either gathering people to Christ or scattering them away. It is clear that Strang is in the business of scattering them away. The Bible also says to mark those and avoid them who cause division in the body through doctrine contrary to Christ. Sadly, it is well beyond the time for discerning Christians to mark Steve Strang and Charisma News as such.